First of all Thank you so much for your kind help and positive response, We are overwhelmed by your care and response. 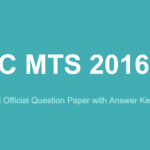 We have managed to collect almost all questions and response sheet of SSC MTS 2016 Re-Examination, which was held in online mode. We are sharing all those questions here in this post. These Questions are very important for upcoming SSC Examinations.